Hakai Institute island science: Why Eric Peterson established a remote research base. Eric Peterson is a biologist who once held research posts at Harvard and McGill University in Montreal. Having made his money in medical imaging, in 2002 he set up the philanthropic Tula Foundation, which supports research at the Hakai Institute and healthcare initiatives in Guatemala. He explains why he created his own institute on a remote Canadian island. Jude Isabella: What drove you to create your own, privately-funded research center, the Hakai Institute? EP: I believe our independence, focus, and long-term commitment will produce great science in a part of the world that deserves attention. I lament that so much science seems episodic and fragmented. I saw in Hakai an opportunity to do definitive work rooted in a specific landscape, over a timescale of decades and across a broad range of disciplines. JI: You set up Hakai on an island off the coast of British Columbia. Why there? EP: I know this coast well—my grandparents traveled up and down it by steamer 100 years ago—so I had long known what a jewel Hakai was, an exotic place, a wild place with spectacular beaches, halfway between Vancouver and Alaska. 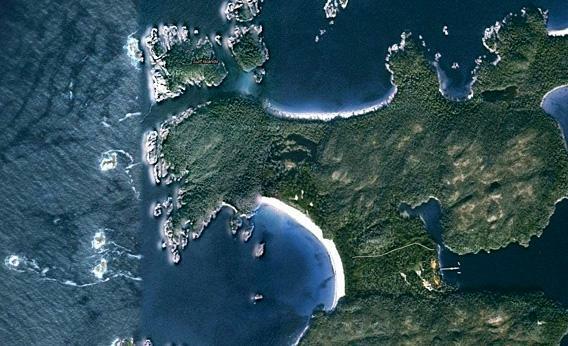 At Hakai we sit on the only deeded land on an uninhabited island, Calvert. The island is 161 square kilometers and is in turn in the middle of an uninhabited 1,200-square-kilometer marine-conservation area. Thanks to our great working partnership with B.C. Parks, this huge and incredibly diverse natural laboratory is at our disposal. JI: What are you studying at Hakai? EP: We have a feast of opportunities in marine and terrestrial ecology. We are drawn to phenomena that cross the boundary between those domains, for example the interaction between the bog forests and the food webs in channels and inlets, or our sand ecosystem that links dunes, beaches and underwater sediments. JI: Is it just ecology that you focus on? EP: We have come to realize that during the millennia since the ice sheets receded, the sheltered bays and channels near Hakai were home to villages and other sites that are among the oldest and most important on the British Columbia coast. We never expected archaeology to be part of our research, but it turns out to be an essential part of the ecological history of the island. JI: How about climate and earth sciences? EP: It goes without saying that, over the coming years, we will monitor how climate change is affecting our ecosystems. We have recently demonstrated our commitment to the earth sciences by commissioning airborne imaging of Calvert and adjacent islands. JI: What is your day-to-day role? EP: I am effectively the mayor of a small town—peak population 100—that must create, manage, and maintain its own services: electricity, water, sewers, networks, telecoms, transport, and a supply chain for food and other goods. JI: In years to come, the Alberta tar sands project could pipe oil to the coast of British Columbia for export. Will that pose a challenge to Hakai? EP: We’ll still be here whichever way that issue goes. Personally, I think shipping unprocessed tar sands product overseas is bad economic policy and worse environmental policy.